Here's a picture of the first whole chicken I ever roasted. It's obviously a "before" picture, and unfortunately I forgot to take a "when it's done" picture. Craig and Kristi both said it tasted good. The veggies were carrots, rutebegas, turnips, red potatoes, an onion, and leeks. I used this recipe, and would recommend it whole-heartedly. Also, the chicken cost less than it weighed. Yes, they were different units of measurement, but still... 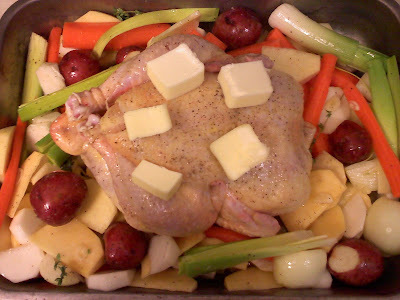 The chicken weighed four pounds and cost less than $4. Next time I think I'll splurge and get a happy chicken if I can find one. Plus, we can make stock this weekend out of the bones!